Meril cardiovascular provides innovations for the treatment of coronary artery disease. Meril Cardiovascular's coronary stents work to open clogged coronary arteries and help treat coronary artery disease (CAD). 1.1 What is Coronary Artery Disease? Coronary artery disease (CAD) is the most common form of heart disease. It is a condition that occurs when the coronary arteries that supply oxygen-rich blood and nutrients to the heart muscles become narrowed or blocked by a gradual build-up of “plaque”. Plaque is made up of fatty deposits (cholesterol), white blood cells, calcium, and other substances that collect over time in the wall of a coronary artery. As the plaque narrows the opening (lumen) of a coronary artery, it makes it difficult for adequate quantity of blood to flow to the heart muscle. This process of plaque formation and narrowing of the vessel diameter is called “atherosclerosis.” Reduction of blood flow to the heart muscle can cause chest pain (angina), shortness of breath, sweating, and pain down the arms (most commonly the left arm). Narrowing of a heart's blood vessel can result in its complete blockage and can progress gradually or can occur suddenly resulting in a heart attack, known as a myocardial infarction. Coronary stents are small, metallic wire mesh tubes (stent) or temporary plastic jackets (scaffold) that help in open a clogged artery and restore adequate blood flow to the heart. 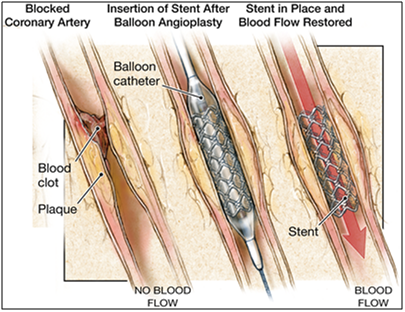 During the stent implantation procedure, cardiologist will place the stent or scaffold over a thin, long tube with a balloon tip called a catheter and insert it into an artery in your groin or arm. Once the stent reaches the clogged artery, your doctor will inflate the balloon to expand the stent or scaffold. When the stent or scaffold reaches the desired location to widen the clogged artery, your doctor will deflate and remove the balloon. The stent will stay in place permanently or scaffold will elute once stabilizing the coronary vessel, and decrease its chance of narrowing again. Over time, the inside lining of the artery (the endothelium) will grow over the surface of the stent or scaffold, making it a normally functioning artery. Bare-metal stent is a stent without a coating polymer. It is a mesh-like tube of thin wire. This type of stent may be used in patients who are allergic to either the polymer or drugs used in drug-eluting stents. i) Permanent Polymer Drug-Eluting Stent: In this type of stent, the polymer stays on the stent permanently, even after all the drug has been released. ii) Bioabsorbable Polymer Drug-Eluting Stent: In this type of stent, the polymer degrades shortly with release of drug. This help better healing by eliminating long-term polymer exposure. The bioresorbable scaffold system (BRS) is a drug eluting system/device on a dissolvable type of scaffold platform which can be absorbed by the body over time. BRS is coated with a drug released from a polymer that disappears over time to reduce the chances of the artery re-narrowing (restenosis). The scaffold itself is absorbed overtime. After treatment, you may be asked to stay in hospital for maximum of 3 to 5 days depending upon speed of recovery. You can find some general recovery tips for recovering from a stent procedure below. It is essential to consult your doctor and follow post-operative instructions. After your procedure, you can return to normal activities gradually. Your doctor can provide advice on simple lifestyle changes that can help improve heart health. After a stent procedure, medications to thin your blood and prevent blood clot are likely to be recommended. These medicines help prevent blood clots from forming in the stent. You should not stop taking these medications unless you are asked to stop by the doctor who implanted your stent. If you stop taking these medications before being instructed to do so by your cardiologist, the chances of blood clot formation on the stent, subsequent heart attack, a stroke or other serious problems are increased. It is important to keep your follow-up appointments after post-procedure, even if you’re feeling well. The first visit is usually two to four weeks after your stent is implanted, with follow-up appointments every six months for the first year. During these visits, your doctor will monitor your progress, evaluate your medications, check the status of your coronary artery disease and determine how the stent is working for you. Carry your Stent Implant Card at all times. If you receive dental or medical care or report to an emergency room/center, show your Stent Implant Card. It is often advised to avoid vigorous exercise and heavy lifting for a short time after a stent procedure. Coronary stent will help restore adequate blood flow to your heart so you can enjoy a healthier, more active life. Learn about precautions you may need to take living with an implanted device and find out how to help prevent the progression of coronary artery disease (CAD). For the healthy life style, at least 2.5 hours of physical activities per week of moderate intensity such as fast walking are recommended. Eat a variety of nutrient rich foods including vegetables, fruits, whole grain high-fibre foods and fish. Quit smoking, alcohol drinking and avoid use of tobacco product. Limit saturated fat, trans-fat and cholesterol. Choose lean meats and poultry without skin and prepare them without added saturated and trans-fat. Switch over to low-fat (1%) and low fat dairy products.